FLL 2008-2009 Climate Challenge Team Based in Maryland. We are a team of 5 homeschoolers looking to have fun with robotics. 1.) 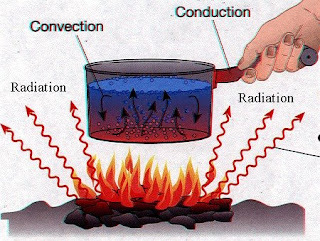 Conduction is when an item or body touches another item or body and absorbs the heat from it. 2.) Convection is when hot fluid rises and then drops down as cool fluid. It forms a circle as it rises and drops. 3.) Radiation is when an item radiates heat to warm the air and other items around it. All of these can happen in the kitchen at the same time. The pan conducts the heat from the stove and heats the water inside which makes it convect, and when you take it off the stove the heat radiates off the stove and that is how heat transfer works in the kitchen. Heat transfer works on the Earth too. The sun's heat strikes Earth and heats up the land or water. As it travels it loses the heat and drops back down as cool water. 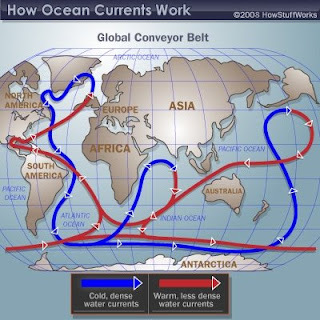 The cool water travels on the bottom of the ocean, and gets heated up again near the Equator. It can warm places like Paris, because hot air from Mexico travels above the water and reaches France and England then the air warms those places and that is how it works on Earth. Our team watched these two videos. They are actually separate parts of one video, made in 1956. They are really good videos and I think you will like them a lot. Thank you Mrs. Tait for teaching us about heat transfer! The videos were great. Nothing like a demonstration to help all the terms make sense. I found myself thinking of the 3 ways of transference like geometric patterns. Conduction is a straight line from A -> B, Convection a more looping pattern and radiation just exploding everywhere at once. Simple, i know but i'm learning. This is my question: Do you think radiation is the post important type of transfer when discussing climate? Or are the other two types just as important? I really liked the example of the kitchen, that explained the transfer types very well. Two of them are important in climate. Conduction does not have anything to do with climate and radiation comes from the sun. The sun sends heat to earth and then makes convection. It is important because it makes air and ocean curents. So it is not radiation that's important it's convection.